The music of Contrarian is not unusual. What is unusual though is the aesthetics of it. Do you remember the sound that “Individual Thought Patterns” had? Cynic’s “Focus”? In the mid 90’s Progressive Death Metal had a sound and a feel to it that was unique and distinctive and “Polemic” feels like it came from that era. The aesthetics, not the progressiveness of death metal, did not really take off from there. It was forgotten for reasons unknown. Maybe it wasn’t that commercial or not that enjoyable. I do not know. I find it enjoyable and adventurous and when I first heard “Polemic” I was positively routing in favor of it and wanting it to be good. I wanted an album that sounded like this and I found it. Well, actually, I did not found it. It found me, but that is another story. It has a 90’s feel to it and the song structure and development is progressive to the core. This is death metal that really is not that much of a trend anymore. No murkiness, no slams and breakdowns. Just good ol’ progressiveness, with jazzy breaks, eloquent and assaulting drumming by George Kollias, solos and leads that fly through the songs making them sound aery. Then the solos dive in, becoming part of the song, the shift is changed, the rhythm brakes and it develops to a new direction that is similar, but not quite. It gives a sense of exploration and creativity, where every instrument is opinionated and plays a vivid role to the whole structure of it, creating a solid entity that never keeps a solid form. “Polemic” as a whole is impressive. It has everything that a progressive album needs and it also has the common sense to keep the restraints on and maintain a feel of a song structure. Listen to “Libertarian Manifesto” and observe, with your ears, maybe with your eyes if you have visualizations while listening to music, the morphing of the music, the change of the structure and the difference in the narration. It feels like a process of building and then the whole of it just sinks into nothingness. From within it another theme is being built, while always maintaining a sense of coherence and storytelling. Production wise, I think the voice was placed deliberately in the center of the whole, maintaining the same breadth, while everything swirls and develops around it. If we see it as a mathematic formula, the voice is the constant and everything else is a variable. This creates an interesting contrast. The guitars are free to move and explore and tell their own stories, as parallel narrations of nonlinguistic entities. While everything in me says ‘yes’, I have found that I will always, and I mean always, check the player when the song “Diogenes At Delphi” is playing. I think, for reasons unmanifested to me, that the album is just a little bit longer than it should. But then I saw that it lasts about 32 minutes and it perplexed me. It still does. Striking the balance between quality and quantity is not an easy task and it almost always results into something that the artists cannot control. It is the listener, as a passive experiencer and a third party, that can offer such an insight and it is not done consciously, but rather as an reaction that derives from the relationship between the listener and the music. But, does this really matter? 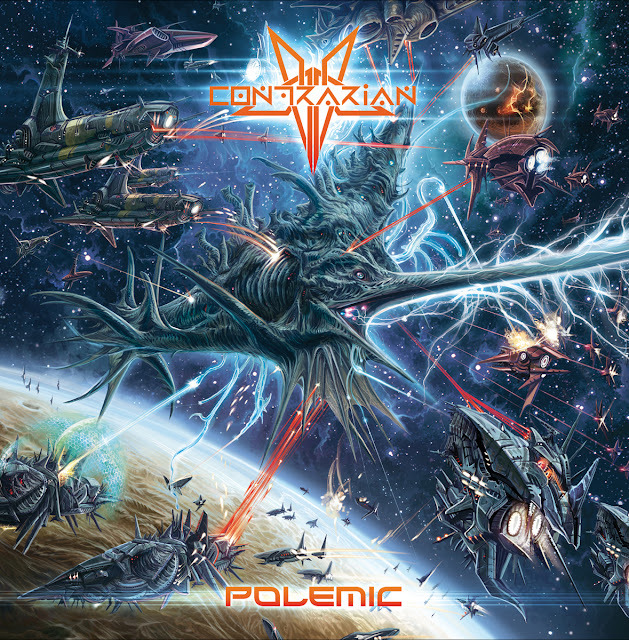 “Polemic” has every ingredient necessary to make and interesting and intriguing progressive death metal album and the overall result is more than satisfying. I want to believe, like Mulder does, that it is the complexity of the song structure that gave this negative impact towards the end of each session. Even if the listener has a great time, nothing remains in memory. But, considering this is their debut album, I am very positive about their future and their ability to create memorable, enjoyable, adventurous and fun albums. The album closes with a cover of Death’s “Nothing Is Everything” and it shows the love and respect that Contrarian have for “Individual Thought Patterns” and Death. Go on. Listen to it. Unknown 12 Ιανουαρίου 2016 - 2:26 μ.μ. Nice album. I was a bit nostalgic recently for this era, and this brought back some of the feeling, but with a newer vibe to it! I don't get how Kollias came onboard, but I'm glad he did....! Vasilis Xenopoulos 12 Ιανουαρίου 2016 - 4:04 μ.μ. I think it is more of a professional collaboration and not kollias being a full time member of Contrarian. At least this is how I understand it.